The Trade Commission of Spain in Chicago, in partnership with the Spanish Institute for Foreign Trade (ICEX) will host an Inverse Trade Mission to Spain on June 1-8, 2007. The multi-industry event includes nearly 100 U.S. companies from 16 different sectors, ranging from different kinds of industrial machinery and equipment to food processing, infrastructures and environmental equipment. The objective of the Mission is to bring together U.S. and Spanish companies and institutions to share best practices and investigate new business endeavors. The mission will kick off in Valencia where participants will have the opportunity to watch the Louis Vuitton Cup Finals regatta as part of the 32nd America’s Cup. The next day, ICEX will host an inaugural ceremony at the City of the Arts and Sciences Auditorium. The remainder of the trip will be custom-designed to pair Spanish and U.S. companies with shared interests for business discussions. Participating U.S. companies and organizations include Energy Alloys, BAE Industries, Massachussetts Technology Collaborative, Inbac (International Business Acceleration Center, from Silicon Valley), Amtrak, the Federal Railroad Administration and the Illinois House of Representatives, among others. Spanish participants include Talgo (train manufacturer), Tecnalia Technology Corporation, the Spanish Network of Research and Technology Centers or Indra (Avionics and traffic control systems). The company Corus colors is developing a low cost photovoltaic coating in the form of a spray that turn steel roofs into large area solar collectors. The project brings together leading researchers from the British universities of Bath, Bangor, Swansea and the Imperial College. It may help deliver a unique solution to cost-effective passive generation of electricity from the walls and roofs of buildings. Corus Colors is the World’s second largest producer of coil coated materials, part of the Corus Steel Group (recently acquired by Tata Steel). (Tree Hugger reports:) Last week, Construmat, the biggest International Building Show, opened its doors in Barcelona. This year, the show has dedicated a whole pavilion to Sustainable Construction where it was possible to visit the R4House, designed by the Valencian architect Luis de Garrido. The R4House prototype consists of two bioclimatic homes (one of 1615 sq. feet and a mini-flat of 323 sq. feet) made from materials that close the loop, such as bamboo and even wool as insulation. The energy consumption of both is zero due to its bioclimatic design with green roofs, the solar panels and the geothermal energy source. The waste production during construction is also zero. Both homes are modular and built from six recycled shipping containers; low-cost and allowing flexibility. The 4 Rs stand for Reuse, Recover, Recycle and Reasoning with the latter being the most important says Garrido. “With the construction sector being very inert and sustainable architecture looking to establish itself, reasoning is required to redesign the construction process and lower its negative impact on the environment.” The construction materials as well as interior ones have been carefully chosen and are all recycled as well as recyclable. 28 companies from all sorts of fields have sponsored this effort. Garrido proposes a concept that embraces “the beauty of imperfection” to mimimize the waste generated by an excess of design. The R4House is however not only ecological but also economical in terms of pricing. The construction cost of the 1615 sq. feet space is $80,946 and the small home costs $16,189. 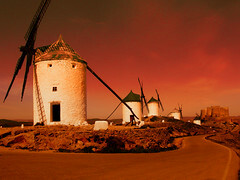 Everyone that has heard about La Mancha, knows from the musical and the Quixote novel that it is a sun-drenched land of windmills that might be giants (or not). Correspondingly, the landscape in the region is dotted here and there with the iconic modern version of the windmills, that make a stellar appearance in the movie “Volver” by Almodovar. Trying to profit from the other natural resource in abundance in the area, regional authorities are pushing forward an ambitious plan to boost solar energy. Besides the plants mentioned in my previous posts in Puertollano (solar thermal power), the city is the site for the Institute of Concentration Photovoltaic Systems or ISFOC (website in Spanish only). These commercial plants are going to be grid-connected and sited in different provinces of the region of Castile-La Mancha. The headquarters of ISFOC will house demonstration plants (200 KW) for each of the technologies employed in the commercial plants. Concentrator Photovoltaic systems are experiencing a very interesting moment worldwide, with record gains in efficiency by Spectrolab (Boeing) and many companies taking their products to market. Spectrolab has an agreement with Solar Systems (Australia) to provide it with 500,000 concentrator solar cell assemblies to be used in remote rural communities. Guascor Foton is one of the pioneers in Europe in this technology, the development of which stems from a partnership with the American company Amonix. Guascor Foton installed the first commercial high concentration CPV plant in Europe at the campus of the Polytechnic University of Madrid. This project was developed in collaboration with the Institute of Solar Energy from the UPM and the Spanish Government Agency for Energy Diversification (IDAE). The company is also working in three aditional solar plants using the same technology with a joint capacity of 3.5 MW in different parts of Spain. Two projects for 50 MW Solar electric thermal plants in Spain have been announced recently. Many more to come. Ener-t Global an Israeli company, and Grupo Enhol, a Spanish group, have sealed a deal to develop solar electric thermal plants in Spain (Renewable Energy Magazine). The first one (50 MW) will be built in Badajoz (Spain), as the area has “optimum radiation and climate conditions, which will achieve a greater performance for the plant“. The electricity produced will be able to power the town of Mérida, capital city of the region. Their agreement includes the creation of a society shared at 50% by both companies, aiming to develop and build plants using parabolic troughs. The total investment will be around 600 million euros. This piece of news follows the announcement made by IDAE and Iberdrola of the construction of another 50 MW plant in Puertollano, not too far away from Badajoz. Expected to be ready next year, the project will cost 200 m euros and is being developed by Iberdrola and IDAE, a Spanish Government body. Construction works have already started in Puertollano ; this is only the first one of a series of ten solar electric thermal plants with the same projected output to be developed in Spain by Iberdrola, the world’s largest renewable energy developer. All the plants will use parabolic trough. Annual production will be around 120 GWh, enough to power a 50,000 people town while avoiding the emission of almost 40,000 tons of carbon dioxide into the atmosphere. Spain was the second country to develop large-scale solar thermal technology with a facility in the Plataforma Solar de Almeria (America was first at the Mojave desert). In fact, Ener-t Global’s team includes members of the original group that developed the technology used in the 354 MW thermo-solar power plants known as the SEGS, operating successfully…not a lot of guessing here… in the Mojave Desert in California for more than 20 years. Nowadays, these technologies are being embraced in both countries at the commercial level, as we have been commenting in previous posts. Margarita Salas is the first woman scientist from Spain to become a member of the National Academy of Sciences. She joins other 17 foreign scientists and 72 American new selected members of the Academy. Members and foreign associates are elected annually in recognition of their distinguished achievements in original research; election is considered one of the highest honors that can be accorded a scientist or engineer. The Academy membership is composed of approximately 2,000 members and 350 foreign associates, of whom more than 200 have won Nobel Prizes. Dr. Salas, a researcher for the Spanish Council of Scientific Research or CSIC, joins the three only Spaniards to have been selected to date, Mr. Antonio García Bellido, the paleontologist Juan Luis Arsuaga and the economist Andreu Mas-Colell. She is currently working at the Severo Ochoa Center for Molecular Biology. Her main line of research is the study of the bacteriophage Phi29 virus. It’s a virus which infects the Bacillus subtilis, a non-pathogenic bacterium which is widely used in biotechnology. It sounds like the beginning of a poem, but this time it is something else: solar power to, eventually, meet the needs of a city of 600,000 people without emitting a single puff of greenhouse gases. People like myself, working in manufacturing in Spain, sometimes are eager to remind foreigners that not everything in in the country revolves around “Sun and beaches”. This special from the BBC about the new solar tower by Solucar in the outskirts of Seville, seems to prove that the first part of the tandem works for industry and technology as well as for tourism. Whoever has been to Seville in summer may tell you that it is certainly a good spot for a solar thermal power plant; they do not seem to be lacking sunrays, definitely. The article captures well the surreal effect of the tower from a distance: After all, it is “A concrete tower – 40 storeys high (377 feet)- bathed in intense white light“. The effect is compounded by “the rays of sunlight reflected by a field of 600 huge mirrors – so intense they illuminate the water vapour and dust hanging in the air“. All in all, a really good article, and, what´s better, with a video to let you get the feeling of having been there in person (braving the heat, the reporter gets inside the tower and goes up to the very top). You are currently browsing the Technology For Life weblog archives for May 2007.